Use the image widget to add an image to any landing page. If your image needs to span the full width of a MOBIT page, the image should have a minimum width of 320 pixels, with height proportional to image width. Drag the image widget onto your landing page, select your image from a folder, then click Choose. If you do not have an existing imagine uploaded to MOBIT and need to upload an image, progress to step 2. To add a new image to MOBIT, drag the image widget onto your landing page, select a folder you would like to upload your image to. If you would like to create a new folder, click the + Folder button to create a new folder. With your folder selected, click the + Image button. Select the image you wold like to upload then click Open. Once your image has been uploaded, select choose. Your image will appear on your landing page. 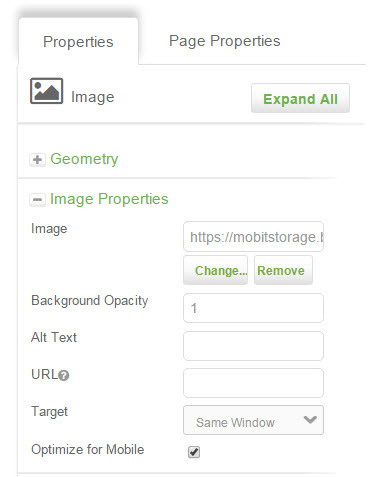 Under the Image Properties section, there is an Optimize for Mobile check box that will optimize the size of your image. When you add an image to your landing page, MOBIT automatically checks this box, improving landing page load time. It is import to note that this may also scale back the resolution of your image slightly. If you do not want MOBIT to optimize your image for mobile, un-check this box and your image will revert to its original size and resolution as uploaded by you. Note, you will only see these changes, when you page is viewed, note in the landing page editor. We do recommend leaving this box check as it improves page load times, however, it does depend on your requirements as to whether or not you use this Optimize for Mobile function. Images will appear clearer on your landing page when they are not optimized, as they are higher quality images.